Posted under Parents' Articles. Updated 24 September 2015. Although meningococcal infections are rare, they are very serious diseases that can cause death. Even with early treatment, there is a risk of serious complications. Fortunately, there is a vaccine to protect your child against many of the infections caused by the meningococcal bacteria. Meningococcal diseases occur when the tissues that surround the brain and spinal cord (called the “meninges”) get infected. If bacterial meningitis is not treated quickly, it can lead to brain problems such as deafness or learning problems. Bacterial meningitis can even lead to death. The meningococcal bacteria is usually spread by coming in contact with respiratory secretions when an infected person coughs or sneezes or by having contact with saliva when drinking from a water bottle, sharing cigarettes, and kissing. The bacteria may live in the throat without causing any symptoms or may cause an infection of the blood or the fluid that surrounds the brain and spinal cord. The most common early symptoms are: high fever, headache, stiff neck, sensitivity to light, nausea, vomiting, and rash. Who is at risk for getting meningococcal disease? Anybody at any age can get meningococcal disease. College students or anyone living in crowded living conditions are particularly at risk because the meningococcal bacteria are easily spread from one person to another. Meningococcal disease is treated with antibiotics such as penicillin. Even with treatment, one in ten people will die. For those who survive, 10-20% may have permanent damage such as deafness, seizures, mental retardation, or loss of fingers and toes. The best way to protect your teen against this serious disease is making sure he/she gets vaccinated! There are 2 categories of meningococcal vaccines. One category protects against Serogroups A, C, W and Y meningococcal disease and another category that protects against Serogroup B meningitis. All together there are six vaccines that are available in the United States: 4 vaccines against Serogroup A,C, W, and Y and two vaccines against Serogroup B.
MenACWY-D (Menactra) was approved in 2005 and is now being used to protect people who are 2-55 years old. In addition, children ages 9 months through 23 months can receive this vaccine as a two-dose series. “MenACWY-D” provides protection against serotypes A, C, W, and Y by linking these molecules to a protein (Diphtheria toxoid) to improve the immune response. Scientists believe it is better than the MPSV4 and protection against meningococcal disease appears to be longer too. MenACWY-CRM (Menveo) was approved in 2010 and is now being used to protect people who are 2-55 years old. “MenACWY-CRM” is also a Meningococcal Conjugate Vaccine, and works similarly to MenACWY-D.
MPSV4 (Menomune) was made available in the 1970’s and is given to those over 2 years old who are at higher risk of meningococcal disease. “MPSV4″ stands for Meningococcal Polysaccharide Vaccine. It protects against four serotypes of meningococcal disease: types A, C, W and Y.
Hib-MenCY-TT (MenHibrix) was approved in June 2012 for very young children ages 6 weeks to 18 months. It is a four-dose series of shots. This vaccine protects against two serotypes: C and Y.
Serogroup B meningococcal vaccines Trumenba (a 3 dose vaccine, approved in October 2014) and Bexsero (a 2 dose vaccine, approved in January 2015) are for use in youth 10-25 years old provides short term protection to help in outbreaks of this infection, those at increased risk of this infection because persistent complement component deficiencies, persons with anatomic or functional asplenia, (lack of functioning spleen), and those working in a lab studying meningococcal bacteria. If your child is between 11-12 years old, he/she should be vaccinated with a quadrivalent meningococcal conjugate vaccine (Menactra® or Menveo®). Both vaccines protect against Serogroups A, C, W, and Y. A booster shot is recommended at age 16-18. If your child doesn’t receive the first dose of the vaccine until he/she is between 13-15, they should still receive a booster shot between 16-18. 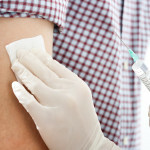 Other people who should get vaccinated for A, C, W, Y are those who plan to travel to places where meningococcal disease is common (such as certain regions of Africa), people who may have come in contact with meningitis, anyone who has a disorder of their immune system, anyone whose spleen has been damaged or had surgery to remove it, and people who study this disease in a lab. The Serogroup B meningococcal vaccine is not yet routinely given unless your child is at risk because of certain preexisting medical conditions or because of exposure. However you can request it. The vaccine is made up of parts of the meningococcal bacteria that cannot cause infection. After the vaccine is given, the body makes antibodies to fight the meningococcal bacteria. These antibodies then help protect a person from infection if they come in contact with someone who has meningococcal disease. Will my child need to get a booster (meningococcal vaccine) when he/she is 16? Researchers have learned that the quadrivalent meningococcal conjugate vaccine doesn’t protect teens for up to 10 years as originally thought; thus a single dose at 11-12 may not protect your child during the time that meningococcal disease is the highest risk (16-23 years of age). Other people considered to be at increased risk are those with disorders of their immune systems, anyone whose spleen has been injured/damaged or had surgery to remove it, people who study this disease in a lab, or people who travel to or live in countries where meningococcal disease is common. In addition, college freshman living in dormitories who received the MPSV4 vaccine 5 or more years ago should receive a dose of either MenACWY-D or MenACWY-CRM. If your child has been in close contact with someone who has been diagnosed with meningococcal disease, it is very important to tell his/her health care provider so that they can be treated with antibiotics. This is true even if your child has had the meningococcal vaccine! All 6 meningococcal vaccines are considered safe and vaccine safety is constantly monitored. Polysaccharide (sugar) meningococcal vaccine has been used extensively since 1981, and millions of doses of meningococcal conjugate vaccine have been given since they were first licensed in 2005. Will my child have any side effects from the meningococcal vaccine? Most people who get vaccinated will not have a side effect and serious allergic reactions are rare. These discomforts are usually temporary but may last for a few days. It is uncommon to have side effects from vaccines but other symptoms may include: fever, dizziness and/or nausea. Anaphylactic reactions requiring emergent care are very rare. If you think your child might have a side-effect from a vaccine, call her health care provider. You can also call 1-800-822-7967 or log on to vaers.hhs.gov. Is there any reason why my child should wait or not get the meningococcal vaccine? Most pre-teens and teens get the meningococcal conjugate vaccines without any problems. However, there are some reasons that your child should wait or not get it. Is there anything else I should know before my child gets the meningococcal vaccine? Yes. It’s a good idea for either you or your child to ask his/her health care provider about their vaccine history. Are there any reasons why he/she shouldn’t get the meningococcal vaccine? Does he/she have any known allergies to any medicine or vaccine? What should he/she do if he/she comes in contact with someone who has meningococcal disease? All you or your teen need to do is to check with his/her health care provider to see if his/her immunizations are up-to-date. Getting the vaccine is far better than taking the chance of being infected with this serious disease.